May all of you have a Very Merry Christmas and a Happy, Healthy, and Prosperous New Year!! 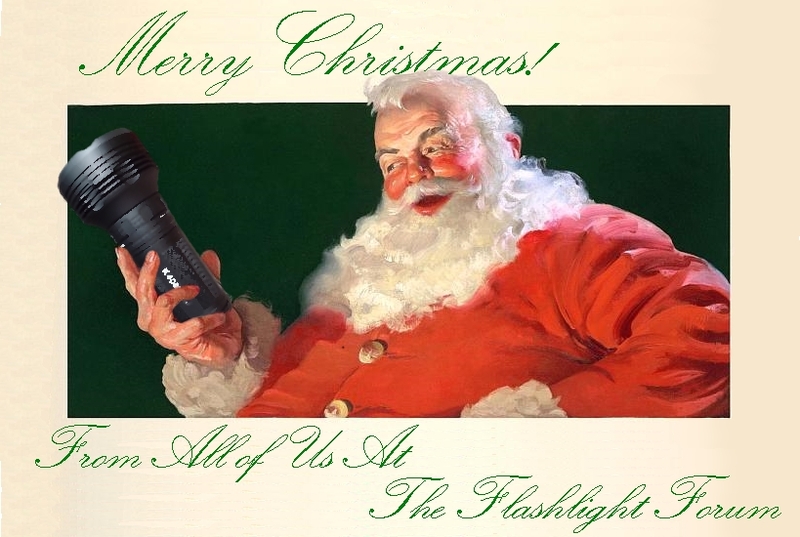 Re: Merry Christmas from all of us here at The Flashlight Forum!! Merry Christmas Johnny and all you wonderful guys!! Thanks for being such wonderful folks... we need more smileys! Thanks JM and spas. Nice Santa you have there. Lucky I'm not a little kid otherwise I may of been scared. May you also have a safe and happy xmas. Ever hear that song, Grandma Got Run Over By a Reindeer? I can't help but think this would not have happened if they had just given her a good flashlight!!! May your days be merry and bright ! If this forum had a "like" button, I would have hit it. Haha that actually made me laugh out loud mate, that would make a great advert for a flashlight company. "Don't let grandma get run over by a reindeer, give her a (insert brand name here) this holiday season."